It’s Premier League launch day and one of the several guests in attendance is our very own ‘special one’ Rafa Benitez. As the standard procedure, he has taken part in several interviews for the likes of Sky, BT Sport, BBC & TalkSport with the main talking point being the seeming lack of spending and investment in the squad over the summer. Rafa seems more than happy to talk about it and hasn’t held back in what he thinks. On Sky Sports this morning he blatantly made his stance be known to the world by categorically confirming he is “not happy” with Newcastle’s transfer business thus far and hopes to bring players in over the coming weeks. It’s Premier League launch day.#NUFC are back in the big time. We have Rafa Benitez as our manager. And he is ‘not happy’. How his latest comments will go down with the club executive Lee Charnley and owner Mike Ashley no one knows for sure. Will it inspire Charnley to get his finger out? Or put his back up? 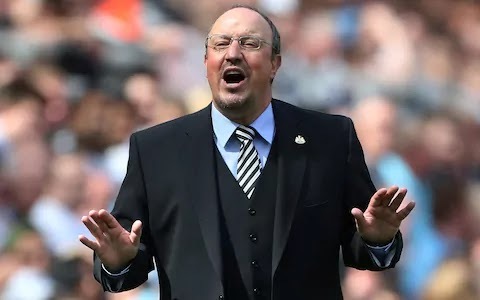 We will find out in due course but one thing is for sure, Rafa is not happy with his current squad and wants the whole world to know that ‘fact’.